At the beginning of November I took my daughter to British Columbia to see big trees, mountains, and relatives. (Her priorities; mine were in reverse order.) Which got me to thinking about various B.C. writers I’ve read: Ethel Wilson (see previous post, Innocent Traveller), Earle Birney, Brian Fawcett, Betty Lambert, P.K. Page, Jane Rule, Andreas Schroeder. Oh, right, how could I forget, D. W. Wilson. Someone I must read: Keath Fraser. And Kate Pullinger (coming up) is from B.C. But today I want to talk about Audrey Thomas, who has in common with Margaret Laurence that she lived in Ghana. Her novel, Intertidal Life, won the Ethel Wilson fiction award in 1985. She won the prize again for her book of short stories, The Wild Blue Yonder, in 1991, and again in 1996 for Coming Down From Wa. I should be writing about Coming Down from Wa, her Ghana novel, but the book that I read on the plane is The Wild Blue Yonder (with a title like that how could I resist it for an airplane book). The story does not specify which country Sarah went to. She simply refers to “Africa.” For example: “She was determined that they would return to Africa.” And “One day the postman brought a parcel and a note from Africa.” By not naming a place, was Thomas making Sarah MacLeod a representative of all missionary wives? I think the most probable reason is that it doesn’t matter to Sarah, who fell in love with a man, not a country. Nor was it uncommon to refer to anywhere in Africa as just that, Africa. Think of Isak Dinesen’s Out of Africa, which is set in Kenya. In fact, I noticed that I used Africa in the Laurence essay that I’ve posted here. We are, however, given clues about the Catholic mission somewhere in Africa that the MacLeods go to. In Edinburgh, she visits a palm house to inhale “the smell of West Africa.” To this she would add “the smell of charcoal burning and the sound of someone pounding fou-fou” to achieve the correct odour she seeks to remember, or rather, to inspire her memory. The local belief in a ghost mother for the ghost baby, the Akua’ba fertility doll, a come and stay child – these are all clues. This British Museum link gives a description similar to Thomas’s description of “a wooden doll, about twelve inches high, with a cylindrical body and a large flat head.” Thomas’s clues make it easy for us to find that Sarah must have received an Asante doll from Ghana. I’ve read with pleasure books by Audrey Thomas, enjoying her play with words and structure, including Mrs. Blood, Blown Figures, Real Mothers, and Latakia, which is set in Greece. My favourable review of Intertidal Life in the Women’s Review of Books (“Love on the Rocks” 1985) is not available online as far as I can discover. 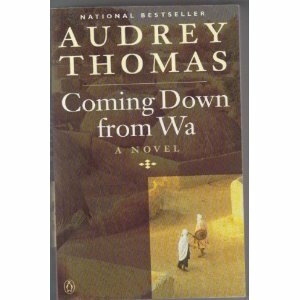 In fact, given Thomas’s many books and her many prizes (see text below from BC Book Prizes), I was surprised by how difficult it was to find reviews of Coming Down from Wa. Here is one from Good Reads, but I feel there must be many more, hiding in plain sight (but not in the Globe and Mail, CBC, Guardian, Vancouver Sun, Quill and Quire, and Canadian Literature). On July 1, 2008, Her Excellency the Right Honourable Michaëlle Jean, Governor General of Canada, announced 75 new appointments to the Order of Canada. …Among the Officers is three-time Ethel Wilson Fiction Prize winner, Audrey Thomas…. 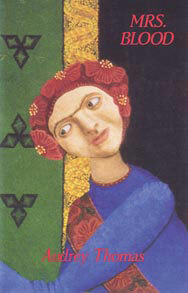 Her novel, Tattycoram, was shortlisted [for the BC Book Prize] in 2006. Ms. Thomas has also received the $15,000 W.O. Mitchell Award (2001), the Marian Engel Award (1987), the $3,000 Canada-Australia Prize (1989), the Canada-Scotland Literary Fellowship (1985-86) and a National Magazine Award. More than 25 of her plays and stories have been broadcast on CBC. -Liesl Jauk, 10 July 2008, “Audrey Thomas made Officer of the Order of Canada,” BC Book Prizes website. Glad to hear from you. When I was searching for images of the book, yours was the site that kept coming up. Thanks very much for adding the link to my thoughts on the stories; when I posted them, I was shocked (as, perhaps, you were too) by how little material was available on her writing, given her stature in the community and the quality of her work. Thanks for following my blog. I’m not familiar with the writers you mention but I have been to Canada a few times and just love the Canadian landscape style of paintings – very original. I saw an exhibition at a museum in Montreal. I’ll look out for some new authors from your selection next time I need to choose some to read for our bookclub.